Here you find displayed my most recent work with the FLI ProLine 16803 CCD camera and Starlightxpress SXVR-H694. Scopes used are a 12"F3.8 corrected Newtonian for high resolution deep sky imaging and a Takahashi FSQ106EDX4 APO astrograph for wide field deep sky imaging. Camera control and image acquisition is via Astroart6 and I use STAR Atlas:Pro to control my Takahashi NJP mount. 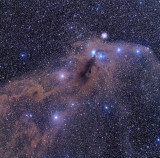 Flat field frames are acomplished using an Aurora Flat Field Panel by Astronomik. oh my! these are breathtaking!